Some Hooked news for ye. We are very excitied as we have just finished our second Hooked Zine and it's looking super fresh if we do say so ourselves. Finally finished, this one has only taken 6 long months to get together what with waiting for work from the artists and me having to re-learn how to use exposure units and what not. 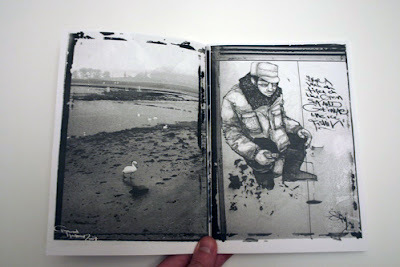 But here is it a DIY black and white photocopied publication with a splash of colour and a hand screenprinted cover!!!! 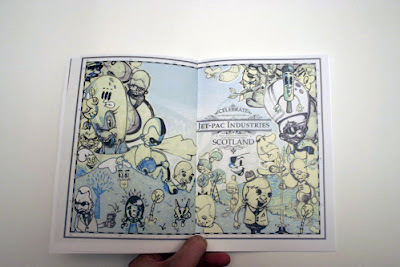 A 34 page zine, A5 in size and featuring illustrations and doodles from a selection international street artists and illustrators. Each issue come individually wrapped. More pictures can be seen over on our Etsy page. 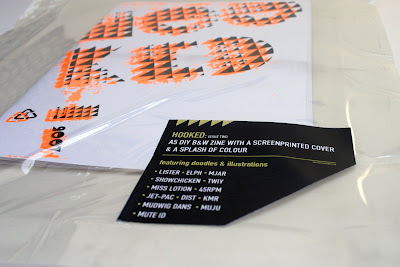 Lister, Elph, mjar, Muju, Twiy, Showchicken, 45RPM, Mudwig Dans, Miss Lotion, Jet-Pac, KMR, Mute-Id and Dist. You can bag yourselves a copy over on our Etsy shop( need to register to use) or via the buy now links before. The prices listed below include postage and packaging of the zine. Hope ye enjoy. How slack am i? This is a beautiful thing mister, i'm delighted with my copy and am happy to endorse it without limit!